I started this journey when I was 8 years old. Throughout the six years, it took to become an Eagle Scout, I would have never achieved this milestone if I had not taken that first step. Remember, you can’t finish something if you don’t start. Take that first step! #2. Learn leadership through experiences. I was given numerous leadership opportunities over the years in Boy Scouts. Also, as one of the final steps toward becoming an Eagle Scout, I had to envision, organize and lead a large community improvement project which involved two other Boy Scout Troops besides the one I belonged to. For this project, we repaired and improved hiking trails and some of the park facilities at a State Park in Southern Florida. This experience gave me confidence and forced me to learn how to lead others to get something this big accomplished, together as a team. There were many times when I wanted to quit. Thankfully, my Father helped me see that finishing something this big was important. I told my friends and other adults at the time that I was going to make it. I would finish. Had I quit I would not only let them down but I would let myself down. This was the beginning of my development as a committed finisher. 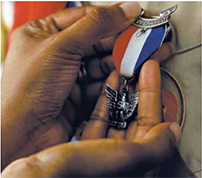 Had I quit my journey to become an Eagle Scout I wonder if I would have finished college or become a Naval Aviator. Are you committed to finishing strong? Finally, I want to thank you for your support. I’m truly grateful for you. Thank you! Question: What is one thing you can celebrate starting today? Leave a comment or reply to this message – I’d love to hear from you!